Small annotations to some pages, may include notes, highlighting or underlining Good condition is defined as: a copy that has been read but remains in clean condition. All of the pages are intact and the cover is intact and the spine may show signs of wear. The book may have minor markings which are not specifically mentioned. Most items will be dispatched the same or the next working day. This is an ex-library book and may have the usual library/used-book markings inside. This book has soft covers. In poor condition, suitable as a reading copy., 600grams, ISBN: 9780801472732. Very Good. 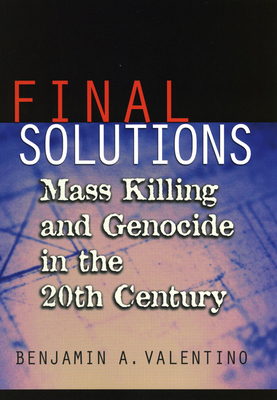 Benjamin A. Valentino finds that ethnic hatreds or discrimination, undemocratic systems of government, and dysfunctions in society play a much smaller role in mass killing and genocide than is commonly assumed. He shows that the impetus for... Trade paperback (US). Glued binding. 317 p. Contains: Illustrations, black & white. Cornell Studies in Security Affairs. Very Good. Ships from Reno, NV. Great condition for a used book! Minimal wear. Shipped to over one million happy customers. Your purchase benefits world literacy!